The US is withholding more than half of a $125m (£90m) instalment destined for the UN relief agency for the Palestinians, American officials say. 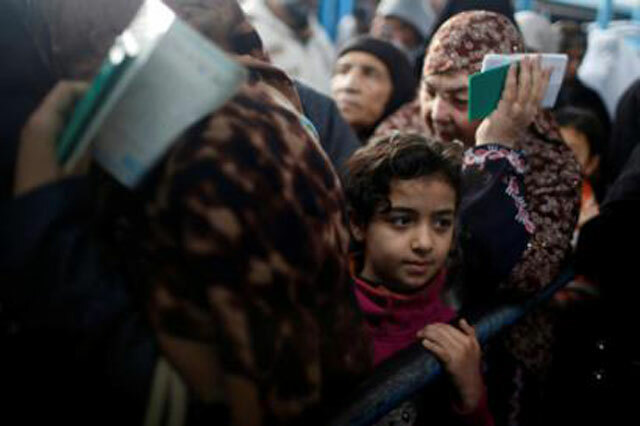 It will provide $60m in aid to the UN Relief and Works Agency (UNRWA) but will hold back a further $65m. A UN official said the move would have devastating consequences for hundreds of thousands of vulnerable people. President Donald Trump said earlier the US could cut aid if Palestinians rejected peace efforts with Israel. The US funds almost 30% of the UN agency's work overall and gave $370m to UNRWA last year. The money withheld is part of this year's first instalment. On Sunday, Palestinian President Mahmoud Abbas sharply attacked Trump's Middle East peace efforts, saying he would not accept any peace plan from the US after it recognised Jerusalem last year as Israel's capital. He accused Israel of putting an end to the 1994 Oslo Accords, which began the peace process. How much aid does the US send to Palestinians? The US's $370m dwarfs the amount given by other donors - in 2016, the second-largest donor, the EU, gave less than half as much to UNWRA, which runs educational, health and social programmes. The US also donated $260m in bilateral aid, with much of it going towards projects administered by the US Agency for International Development (USAid). Those projects are run by non-governmental organisations involved in humanitarian assistance, economic development, democratic reform, improving water access and other infrastructure, healthcare, education, and vocational training. By contrast, Israel receives more than $3bn in military aid per year from the US. What impact might the aid suspension have? Jan Egeland, the former UN humanitarian chief who now serves as its humanitarian co-ordinator for Syria, called on other donor nations to cover the shortfall caused by the US move. The withdrawal of funds would, he said, have "devastating consequences for vulnerable Palestinian refugees across the Middle East, including hundreds of thousands of refugee children in the West Bank and Gaza, Lebanon, Jordan and Syria who depend on the agency for their education". It would also "deny their parents a social safety net that helps them to survive, and undermine the UN agency's ability to respond in the event of another flare up in the conflict". The Palestine Liberation Organization, an umbrella group for Palestinian factions, tweeted that the Trump administration seemed to be following an Israeli policy of dismantling "the one agency that was established by the international community to protect the rights of the Palestinian refugees". What is Israel's position? Its ambassador to the UN, Danny Danon, called for aid to UNRWA to be scrapped completely. He accused the agency of misusing humanitarian aid and supporting "anti-Israel propaganda". "It is time for this absurdity to end and for humanitarian funds to be directed towards their intended purpose - the welfare of refugees," he said. Why is the status of Jerusalem so contentious? The president's decision last month to recognise Jerusalem as Israel's capital and begin preparations to move the US embassy there from Tel Aviv were denounced by the Palestinians, who said it showed the US could not be a neutral mediator. We have the same problem here. Free higher education given in state uni. under a democracy resulted in street marches with twisted mentality, brain washed ideology, boycotting lectures, and struggling to topple the very govt. which is giving all this free. Good trading needed to receive good education in exchange.